Sweet image! Looks like they are lifetime friends. 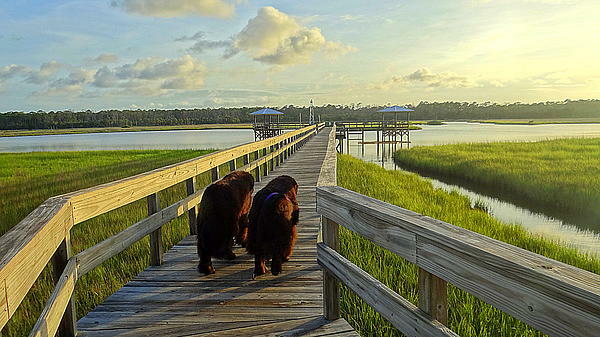 Gorgeous image...wonderful almost ethereal effect from the light...lovely view...sweet dogs!!! 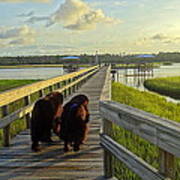 A pair of Newfoundland dogs stroll side by side along a wooden dock on a beautiful evening near Port Orange and New Smyrna Florida. 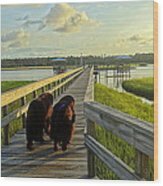 Doris Leeper Park in Spruce Creek Preserve provide the public with a close up encounter of the natural beauty coastal Florida has to offer. This photo was taken on an springtime late afternoon walk with my two Newfies. 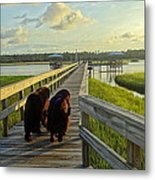 The vibrant colors of the marsh grasses blending into the evening sky make this artistic photo that all nature and dog lovers will appreciate. Welcome and thank you for stopping by to view my photography. I love capturing the beauty of nature and the world around me. I am happy to be able to share what I see. Please check back often as I am continuously adding new images. Thank you for all of your support, comments and feedback.